You must make reservations at least 5 minutes in advance of the time at Shoji Sushi & Hibachi. Experience our distinctive menu featuring traditional Japanese favorites and innovative specialties. While dining with us you will get to watch in delight as one of our highly skilled Chefs prepares your meal right before your very own eyes, making a unique interactive dining experience for all. Our menu features everything from mouthwatering certified angus steaks, tender chicken breasts, garden fresh vegetables, and succulent seafood, to an extensive variety of sushi. We also offer private hibachi room can seat up to 14 , its perfect for celebrating a birthday, anniversary or corporate event for lunch and dinner. 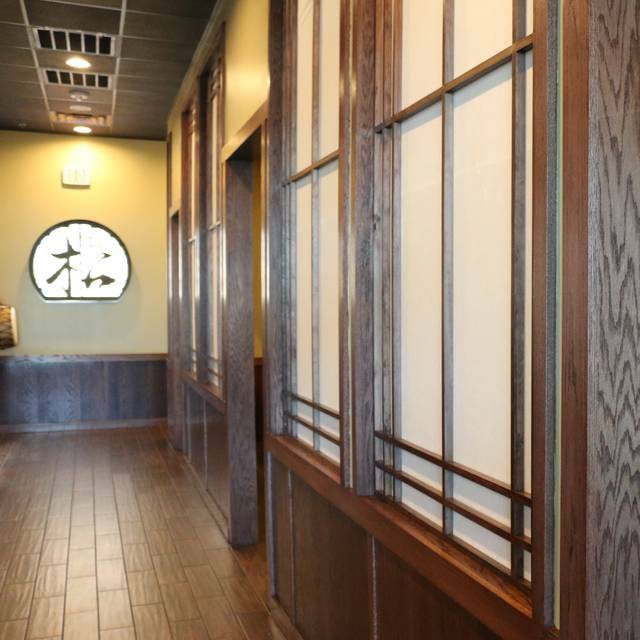 Shoji Sushi and Hibachi welcomes you to a pleasant and memorable dining experience. I loved it! Excellent service and outstanding food awesome idea for Prom!! Wonderful. Much appreciated, had a great time. Food is great and at a good price! Everyone is real nice and very helpful! The cook was not engaged. We went for the experience and entertainment. Very disappointed with the lack of interest the cook showed. Food was very good and portion sizes were large. Waitress service could use some improvements. Waitress appeared to not be happy as she did not smile and did not engage with us. She paid little attention to detail as she couldn't remember who ordered what at our table (there was only 3 of us) and she seemed as if she was being bothered when we asked for certain items that we did not have at our table. My family and I went to Shoji’s for Valentine’s Day dinner. The food was great, the chef was hilarious and talented, and overall the service was amazing. When we were seated, we were seated in a whole separate room where there wasn’t any noise whatsoever! Very enjoyable and will come back again soon! Kid friendly. Hibachi chefs were interactive with my daughter. Quick service for Valentine's Day. Food was good and the chef put on a good show. Great place for family dinner! Meal was almost over before sushi came out, and there was no presentation or interaction from the chef. Wonderful! Just an overall great experience! The food, the service, just all of it! The only negative was the drums they use when singing “Happy Birthday”. There were 4 or 5 different people having birthdays and the staff beats on the drums while walking to the table and then beats on them repeatedly during the song. I’m all about celebrating someone’s birthday and making them feel special but this is somewhat overboard. Our chef was great and did a great job engaging us. The food was cooked perfectly! One of the best hibachi restaurants in town! I'm a frequent customer, love Shoji! We enjoyed our food but came out of there smelling horrible - I know you smell after Hibachi but this was as if their ventilation system needed help. Our Chef was great / server could have cared less about being there and added a 18% tip onto our check 2 Adults / 4 children. Its close / convenient but nowhere as great as Benihana. Won’t go back for sure. Used to be great service, but this time was a mess. Constantly had to look for server, food was blah..not used to this from them. Then server drops mandatory 18% tip for 6 after never actually doing anything. Complete crap and made me say never again will I get ripped off here. Good food but service is slow. Chef puts on a good show. Excellent food..... friendly and engaging chef.... attentive service. I would highly recommend the filet and scallops. Favorite restaurant. We go ther about 4 times a year and are never disappointed! First time visiting and it was terrific. The food was fresh and tasty. Did not like the lighting in the hibachi room but we still loved the experience. The waiter talked about having been drunk until 3am the night prior in front of our 3 and 5 year olds. He chatted with a guest he knew the entire time he cooked. Steak was overdone. Absolutely love this restaurant. We've been to quite a few Japanese/ Hibachi restaurants and this is the best. We will happily take the drive. Food was amazingly fresh and so good. Our kids have never been to hibachi before and they enjoyed the environment as well as the food. It was a win win for all of us. Our party of 6 (3 adults 3 children- 2 who shared a plate) ate for $125 (one of us ordered and appetizer). They even gave my husband a piece of cake for his birthday. :-) We will happily be back. Great Place, great people outstanding food and awesome cook. Server was wonderful. My family loves hibachi type food and this is our favorite spot, we've been many times and keep going back. It is nice and clean, yummy food and entertaining chefs! A real gem hidden in a strip mall. This was one of the best Japanese meals we have had in the metroplex. Everything was fresh, hot when appropriate, and served quickly and politely. Even the small things from the edamame appetizer to the green tea ice cream were outstanding. We will definitely be back. The food is great and so are the chefs. Our waitress was less than friendly. She was actually our waitress on a previous visit. She never smiles and she rolls her eyes everytime we asked for something. Management is extremely nice so I'm not sure why they have such unfriendly staff. My husband, kids and I went here for our 11th wedding anniversary this past weekend. It was amazing. The atmosphere was delightful, not too loud, not too quiet. The food was spectacular, fresh, and the chef was amazing and made me laugh. Very kid friendly, and also date friendly. Great for sharing, fabulous dessert menu and drink menu. All food was very fresh! Celebrated our daughters 12th birthday. The chef, food and service was great. Chef and waitstaff were very accommodating and helpful. Food was fresh and much better than some of the other local hibachi restaurants we've frequented. Location is a bit odd, but once you're inside it is fine. Highly recommend. Always a good meal with great people! Great chef he was a lot of fun and very funny :) we had a great time.